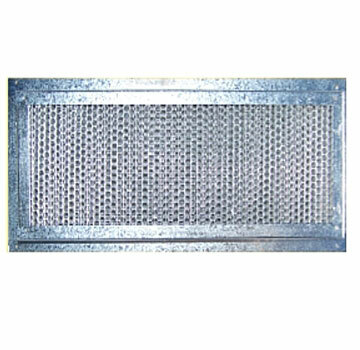 Vulcan Fire Stop Honeycomb Matrix with Screen Mesh built into galvanized steel frame. Designed for rear mount on Stucco with foam structures. Vulcan Vent matrix is 1/4” hexagon expanded aluminum, coated with an intumescent coating from Firefree Coatings Inc. The coating swells up when exposed to high temperatures and closes off the cells, effectively blocking off fire & ember intrusion. The Vulcan Vent™was designed to meet the new California Building code SFM 12-7A of the California Wildland-Urban Interface fire code program.